Virgin Piña Colada Green Smoothie - Your process has a purpose. This Piña Colada Green Smoothie will send your taste buds to the tropics! Pineapple is both high in vitamin C and manganese, essential for energy production and antioxidant defenses. Coconut milk works wonders for the hair and skin as the fatty acids act as a moisturizer and prevent infections like acne. 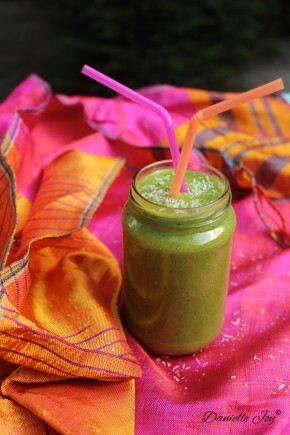 Start off your day great with this tropical green smoothie! Put pineapple, spinach, banana, and coconut milk in blender, respectively. Thanks, Liane! I saw you posted every day during Vegan Month of Food. Way to go! I love green smoothies! I think I may just run in my kitchen and make this. Thank you for sharing!! !